This Spring, I’ll be publishing a new book entitled A Member Is Worth a Thousand Visitors: A Proven Method For Making More Money Online. We’re previewing each of these forces to give you a taste of what the book can do to transform your business. When my team was working to identify the primary forces behind increasing online revenue, we discovered that the natural first step is to find and properly engage your “whales.” (Yes, whales!) Your whales are your most enthusiastic and involved customers. In the book, I profile some highly successful businesses—such as Dollar Shave Club and Wynn Resorts—who have flourished because of their dogged commitment to focusing on their whales. If you’re going to dedicate yourself to catering to those whales, though, you first need to understand them. You need to figure out who they are, what they want, and how they’re finding you. The best way to answer those questions is to go straight to the source. By talking to them, conducting surveys, and looking at studies, you can get to the heart of what they really want and need. From there, you can figure out what it is that you can do for them and how to go about executing it. Typically in consumer research, the approach is to figure out why people aren’t buying from you so that you can find ways to reach them and convert them. And while there is value in that theory, you’re going to glean a lot more from talking to those customers who are already loyal to you. Figuring out how they tick can help you find more people like them. According to research from Nielsen, the top 10% of your customers—your whales—account for as much as 70% of your overall sales. This ultra-engaged group behaves predictably. (When they say they’ll buy, they do.) And as your number one fans, they love to be a part of your product development process. While you might assume that your whales will always be your high rollers and big spenders, that’s not necessarily true. Whales are your most enthusiastic consumers, but they’re not always the highest-paying ones. You may have some whales who aren’t spending a ton with you now but who love your product and could pay more if given the proper motivation. At the same time, you may have “spendier” clients who aren’t truly committed to your brand and will easily jump ship if a competitor offers them a lower price. You’ll find that the feedback of that second group isn’t as helpful because their loyalties are fickle. So don’t just seek out your top spenders; look for your die-hard fans—everybody has their own Phil Basser! Your brand fanatics are the people who tell everyone they know about your product or content and encourage them to check you out. That organic word-of-mouth is what leads to similarly passionate whales discovering your company. They don’t just make up your customer base; they inspire your company’s community. To figure out which of your customers have whale potential, analyze your user data to find those people who both regularly purchase from you and frequently interact with your brand. This could range from looking at email data to see who opens them and clicks on your links to examining social media interactions and event attendance. Through this process, you may even find that there are groups out there who are reaching out and wanting to communicate with your brand that you haven’t properly engaged yet. The key is to look for meaningful interactions. Someone who likes your posts on Facebook semi-regularly, for example, isn’t necessarily a dedicated fan. After all, all they’ve done is click the occasional button. But someone who regularly shares your content with their own multi-paragraph analysis added to it, on the other hand, is someone who has made clear they believe in your brand and want to carry the torch for you. Turning customer enthusiasm into real profit is going to take work on your part, of course. You need to make sure you’re offering your whales something they truly need and can’t get from anyone else at the same level. Monetizing your whales starts by listening to them. Conduct formal interviews with a small handful of your whales. You’ll want to get hard data about their purchasing habits, and you’ll also want to talk to them about their emotional attachments to your brand. Why do they love you? What do you offer that no one else does? Is there something they’re still missing from their interactions with you? Once you have a baseline for what you’re already doing right and where you could stand to improve, survey a few dozen of your whales to validate your interviews or inspire even more fresh ideas. Create an internal value proposition. This is a statement that breaks down who your target audience is, what they desperately need, and how you plan to deliver that to them through your product or service. In short: What problem are you solving? In order to build this, you need to answer the who, what, when, where, why, and how of your whales’ experience. If you don’t have the answers to those questions, you need to do more research. Once you have established a value proposition based on the data you gathered from your interviews and surveys, you’re not done! You need to test and retest every few months to make sure you’re still providing your whales with what they need to continue earning their loyalty. We’ve just scratched the surface here with how you can (and should) focus your business on your whales! 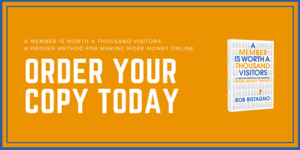 To go more in-depth with case studies, step-by-step guides, and a whale interview checklist, order your copy of the book: A Member Is Worth a Thousand Visitors: A Proven Method For Making More Money Online below.